Kate Middleton–excuse me–Her Royal Highness Catherine, Duchess of Wales, exceeded every expectation this morning as she wed her Prince Charming, William. Designers around the world are scrambling to debut knock-offs and spin-off and “inspired-by” gowns aimed at replicating the genius of Alexander McQueen designer Sarah Burton. While they work at a breathless pace, we wanted to feature a few gowns already available that offer the same Fairy Tale look as Kate’s. Wang brings her own signature style to the timeless design with an airy ebony bow that emphasizes the bride’s narrow waist and adds a touch of whimsey and romance. 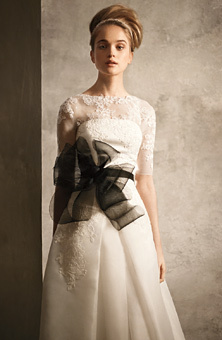 The best part about this gown–it’s only $1,300! 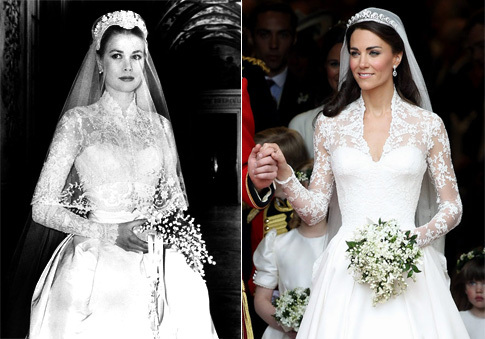 Saab’s creation plays homeage to Grace’s gown with it’s embroidered lace, but, like Kate’s dress, captures a more modern allure with it’s v-neckline. These are only a few of the Kate Middleton look-alike gowns available at the moment. And stay tuned–over the next 24 hours expect to find direct knock-offs flooding the market! In the meantime, want a better look at Kate’s gown? Check out Fashionista’s suite of pictures–they’ve got photos of the Royal Bride and her dress from every angle. Enter your email address to subscribe to good taste and receive notifications of new posts by email. Lobster Rolls, Tacos, Doughnuts, (and Ukeleles!) at the Brooklyn Flea…Oh My! Copyright © 2010 gtfoodfashion. All rights reserved. Reproduction of any material without written permission is strictly prohibited.